West Windsor, N.J. – It’s awards time once again at Mercer County Community College’s (MCCC’s) Kelsey Theatre. The “2016 Kelsey Theatre Awards,” a Tony Awards-inspired evening that celebrates the best theatrical productions and performers from the 2015-16 season, takes place Saturday, Aug. 20, starting at 7 p.m. Kelsey Theatre is located on MCCC’s West Windsor campus, 1200 Old Trenton Road. Based on voting by Kelsey Theatre fans, the Kelsey Awards will highlight the best performances, best technical achievements, best direction and best choreography from the past year. The ceremony will also honor Pete Labriola with a Lifetime Achievement Award. Labriola has been an innovator in the theater community for decades and has served as artistic director for Pierrot Productions, one of the companies that performs at Kelsey Theatre, since 1989. The evening will feature performances by the casts of “The Addams Family,” “Mary Poppins,” “Violet,” and “City of Angels.” New this year will be preview performances from two upcoming shows: “Miss Saigon” (Sept. 9 to 25) and “In The Heights” (Oct. 14 to 23), along with a reunion performance by the cast of “Avenue Q” from 2013. 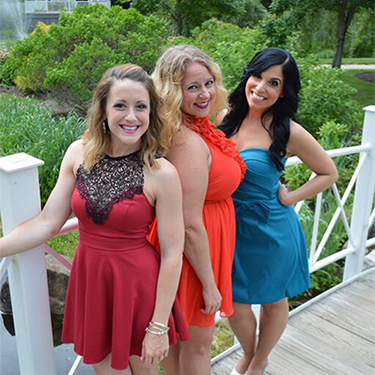 Hosts for this year’s show are comediennes Jaimie McMillin, Maria Aromando, and Kim Cupo. The Kelsey Awards is an entertaining variety show and awards ceremony rolled into one. Pictured are co-hosts Kim Cupo, Jaimie McMillin and Maria Aromando. “To gather some of the best talent in New Jersey and have them on one stage in one big show is truly is a unique night of enjoyment for theater fans,” said Kyrus Westcott, the show’s producer, director and head writer. The nomination round took place in early July. The second round of voting, which will decide the winners, will be held Aug. 13 to 18. For more information, visit www.KelseyAwards.com. Tickets are $16 and are available online at www.kelseytheatre.net or by calling the Kelsey Theatre Box Office at 609-570-3333. Kelsey Theatre is wheelchair accessible, with free parking available next to the theater.